Everyone should know how to cook. The current fascination with food doesn't mean jack if people only spend time with what they ingest at restaurants. Cool, you can find out where your chicken grew up right before it's plated. But if you've never broken down an entire chicken, popped the joints and cut the ligaments with a boning knife, your opinion counts less. Enter: the kitchen. No, actually drag your carcass into the kitchen. Do something that requires more than boiling water. If you want to know food, you have to get dirty with it. Food52, a great resource for recipes and techniques, shares this philosophy; they contributed the fine print (and photos) for the following skills. 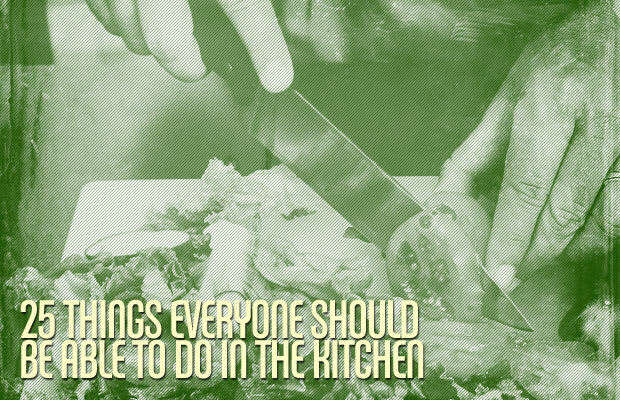 These are the 25 things everyone should be able to do in the kitchen.